It seems that global warming has become the environmental cause du jour, thanks no doubt to former Vice President Al Gore and his Oscar® winning film “An Inconvenient Truth.” Living in South Florida, it is often difficult to tell if the temperature is going up, as it would simply go from “Hot” to “Uncomfortably Hot,” without anyone noticing. So while a 68 degree December day may be evidence enough for northerners, we down here have little to worry about from climate change as we already roast on a regular basis, right? Oh, yeah. Then there’s that whole “melting of the polar ice caps” thing. That phenomenon going on now that threatens to raise ocean levels anywhere between 7 to 15 feet in the next 60 years depending on who you listen to. And seeing as how our entire city looks like a cookie sheet with lights placed on top of the ocean, there may be reason for one or two of us to be a little concerned. For those unfamiliar, the rising temperature of the Earth is causing unprecedented melt off of glaciers in Greenland and Antarctica, which will potentially make low-lying coastal areas in the US, Canada and South America a modern-day Atlantis. Except with massive condos sticking out of the ocean to mark their presence. Since preventive action has never really been the forte of American environmental policy, many cities are already talking about potential sea walls and other ways of keeping the rising tide from taking over their populations. In places where planning and efficient local government are a way of life, places like New York and Boston, this seems like a realistic possibility and one that is vital to the national interest. But South Florida? Not so much. Seeing as how it takes us 15 years to expand an 18 mile expressway and we still haven’t quite figured out how to stop flooding when it rains for more than a day and a half, something tells me this place is going to be some sort of apocalyptic wasteland in about 100 years. Imagine if you will the skyscrapers of downtown and the condos of Brickell covered in vegetation and abandoned for a quarter century. Imagine our major thoroughfares like Biscayne Blvd. and South Dixie Highway under 7 feet of water. The only remnant of transportation will be the Metrorail, no doubt leading future anthropologists to think we were on the cutting edge of mass-transportation and that it is a shame such a culturally advanced city had to be ruined. Then they’ll stumble on Hialeah and retract that whole statement. 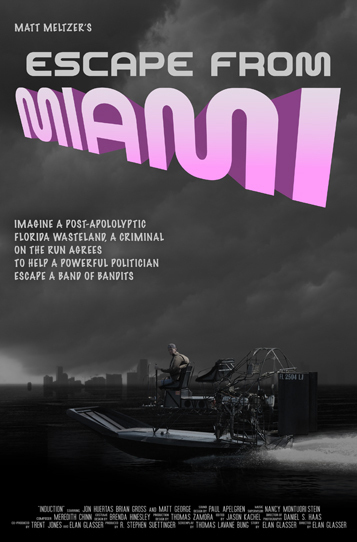 In a city where corruption is commonplace and accepted, where the public good is always sacrificed for the benefit of political leaders, is it even a question that Miami will be the first major American casualty of rising oceans? Most video projections show areas as far west as the Palmetto being completely uninhabitable and the Keys being totally destroyed. This will effectively make Kendall the new South Beach and Homestead the new Key West. So buy up your property now. And what will be our local politicians’ (and near-bankrupt and desperate real-estate developers’) solution to all the displaced from Brickell and South Beach? My guess is dredging more of the Everglades. Because nothing solves an environmental crisis better than destroying wetlands. Never mind the fact that the Everglades in South Florida sit a good 18 feet lower than Miami or Naples. You can always use the demolished buildings of downtown as landfill. Should this fail, Florida may end up resembling what it was at the turn of the 20th century: A state whose southern half is completely uninhabitable. So that placing of the capital in Tallahassee was only logistically inconvenient for about 100 years. The southern half of the state will be an interesting airboat ride attraction for Central and North Florida theme parks, examining the ruins of what was once the 11th largest city in America. There will no doubt be squatters living in abandoned penthouses at Portofino and the Yacht Club, fishing for their meals off their balconies and boiling salt water for drinking. Of course this doomsday scenario is wholly avoidable, but sadly Miami is just not the sort of place to ever sacrifice monetary gain for anything. So while trying to construct a sea wall, or God forbid trying to curb carbon dioxide emissions or regulating development, might ultimately be a better course of action for our region, no sane person should think our civic leaders have any intentions of telling anyone no until it is too late. It is not that global warming is going to destroy the United States. Bangladesh, sure. Most of Africa, without a doubt. But much like with healthcare the rich always have enough money to survive and our country is, if nothing else, rich. But when it comes to excessive waste, unlimited concession to business and development and wanton disregard for the environment, South Florida is the undisputed champion. This is why while hope for New York, Los Angeles, Washington DC and other major coastal metropolitan areas is legitimate, the combination of low elevation and lower environmental awareness bodes very poorly for our region”>environmental awareness bodes very poorly for our region. If you think the real estate market is crashing now, imagine when people realize that the city will be uninhabitable in less than a century. So wise up, Miami. This place may be doomed. I plan to enjoy the city for as long as it exists, but it may very well be the major American casualty of Climate. Don’t buy anything too expensive, don’t plan to die here (unless it is by drowning) and by no means should you expect anyone to have a solution that does not involve doing more damage than has already been done. Love it while you can, folks, because this city is not going to be here forever. "Florida Climate Projections: Enjoy Miami While You Can"
Great post Matt! Sadly change, albeit good or bad, is a natural process. Granted there is nothing natural about being apathetic to changes and ways to counteract or deeeelaaay them but at least articles like this one put into perspective the importance of preparing, planning and ENJOYING! I definitely am going to love it as long as I can ‘cuz much like the city, I don’t think I’ll be here forever either (although I’d give up an appendage to do so)! Great article, Matt. You paint a wild vision of what Florida might be like if we don’t get our act together. After reading your piece, I was curious to learn how Florida compared to other states…According to Tom Peterson, executive director of the Center for Climate Strategies, Florida is among the top 30 emitters of greenhouses gases in the world. And Florida ranks third, after Texas and California, as the states consuming the most energy. Has anyone seen “An Inconvenient Truth”? Half-way through the film, Al Gore does an excellent job explaining how Florida could be wiped out in 50 years. WHY AREN’T MORE PEOPLE CONCERNED ABOUT THIS? The climate change is not that much connected to the human’s activities. One vulcano spreads as much of carbon dioxide per one time as the whole humanity in one year. That’s inconvenient truth for Al Gore to notice. Of course, that film helped him to establish political positions and the Nobel prize. People, stop panic. You are too small to change global climat. We need to think how to adopt ourselves to the new changes. Of course, ecology is our concern, poison gases, plastics in the ocean, volatiles, etc. - this what need to be solved no matter what. But climat change - it’s different… If you think that scientists can say something for sure about this - you are wrong. There are few theories, none of them works 100%. I know this, because I work in that field. Wow very interesting post. I read the whole thing without blinking. This got me thinking about Miami.